Huge momentum swings and bragging rights for the West Linn-Wilsonville School District. Friday night's West Linn at Wilsonville boys basketball game had all that and more, with the Wildcats pulling away at the end to beat the Lions 66-62 in non-league play at Wilsonville High School. 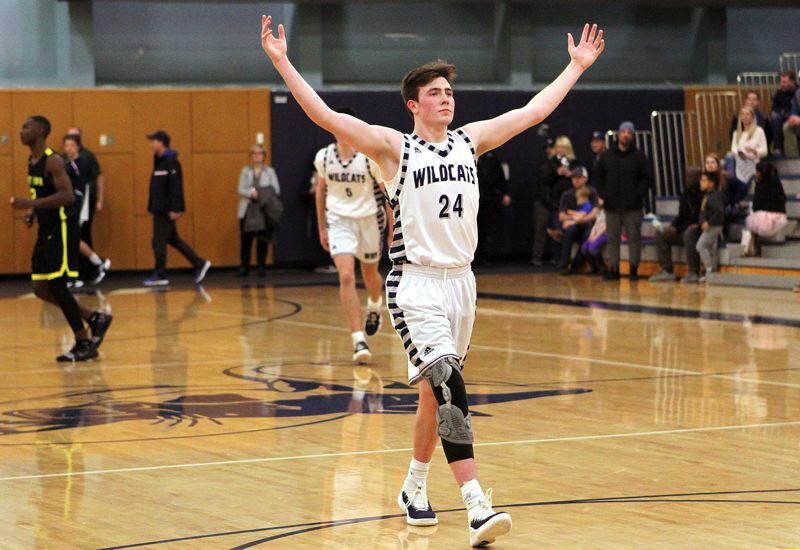 "Beating a team like that, it feels amazing … especially considering the caliber of the team they have," said Wilsonville senior guard Jack Roche, who finished with 15 points on 4 of 7 shooting from the field (including three 3-pointers) and 4 of 8 foul shots. "I mean (Micah Garrett, Drayton Caoile, Bryson Crockett), it would be harder to find three better guards throughout the state." "It feels great. They are a really good team," said Wildcat junior wing/post Keegan Shivers, who led his team with 16 points on 8 of 11 shooting from the floor. "But we worked for this game. We had to work really hard. We had to do all the things right this game. They're a great team and it's a great win for us." With the win — the Wildcats' fourth straight — Wilsonville improved to 4-0 in non-league play, while the Lions lost for the first time and fell to 1-1 on the season. "We didn't get stops," explained West Linn junior guard Micah Garrett, who led all scorers with 23 points on 10 of 22 shooting from the field (including three 3-pointers). "They went at us the whole game and we didn't come back with enough stops." "We just got beat on the back doors," said Lion junior guard Bryson Crockett, who added 12 points on 5 of 11 shooting from the floor with two "3s." "When we locked up on defense, we'd get out and run and that's what we're best at doing is running." Wilsonville started quickly on its home court, getting five early points from Roche (including a 3-pointer) as the Wildcats knocked down five of their first six shots to grab a 13-6 lead when Nolan Thebiay took a pass from Dakota Reber and scored on the fast break with 4 minutes, 42 seconds left in the first quarter. The Lions answered with a vengeance, stitching together a 10-0 run over the next 2:51, getting a driving hoop from Caoile, a spin into the lane and a bank shot by Crockett, a fast break basket by Oreon Courtney, a breakaway hoop from Garrett and a tough shot by Caoile from the left side that gave his team a 16-13 edge with 1:51 to go in the frame. Shivers took over there, though, with three baskets in just 2:47 at the end of the first quarter and start of the second. After that, Reber scored from the right block, Zachary Rivers connected on the break and Reber ended another fast break with a dunk set up by Rivers that gave the Wildcats a 25-22 edge with 3:41 left in the half. In the next of the game's many big momentum shifts, the Lions caught fire again, ripping off 14 straight points in just 2:08 to grab the biggest lead of the game at 36-25. Garrett got that started with a jumpshot, Caoile buried a "3," Garrett hit another jumper, Courtney finished a break, Crockett knocked down a 3-pointer of his own and Gus Michelon converted a pullup for that 11-point lead with 57 seconds left in the half. Still down 38-27 at the start of the second half, the Wildcats came out energized on defense, got into the passing lanes and got back in the game. Wilsonville knocked down eight of its first nine shots in the second half and put together a 22-4 run that was highlighted by six Thebiay points, five each from Reber and Rivers, and a 3-pointer by Roche to grab a 49-42 lead with 2:28 to go in the third period. The Lions edged back within 51-49 when Courtney muscled his way down the lane and scored 24 seconds into the fourth quarter, but when the Wildcats pushed their lead back to seven points — the last time at 63-56 on a Roche "3" assisted by Gabe Reichle with 2:13 left in the game — it looked like West Linn was done. Garrett disagreed, however, and knocked down back-to-back 3-pointers in the final minute and cut his team's deficit to 63-62 before Roche sealed his team's win with three foul shots in the last 32 seconds. "Our coach always tells us two things, 'Together and tough' and that's what we were tonight," Roche said. "Especially in the second half after a tougher first half." "We stuck with the game plan our coach made and it worked," Shivers said. "We just had to do what we needed to do to win this game." On their side of the court, the Lions knew they'd had a chance to win, knew what they'd done wrong and vowed to fix their mistakes. "I think that's a good game for the preseason," Crockett said. "We learned a lot. There's a lot of stuff to work on." "When it got tough, we put our heads down," Garrett added. "But we've got the whole season ahead of us. We're not worried about this game. Yeah, it's going to hurt for a day or two, but we'll be right back at it." Reber finished with 11 points, Rivers 10 and Thebiay eight for Wilsonville, while Courtney had 17 for West Linn and Caoile nine. In upcoming games, Wilsonville will face Crook County in the first round of the Capitol Classic at Willamette University at 8:30 p.m. Tuesday, while the Lions open the Iolani Classic tournament in Hawaii with a game against Hawaii's Roosevelt at 5 p.m. Tuesday.